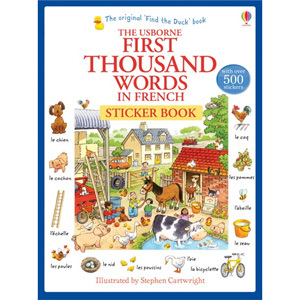 The Usborne First Thousand Words in French Sticker Book serves as a comprehensive illustrated vocabulary-builder, teaching 1000 new French words. 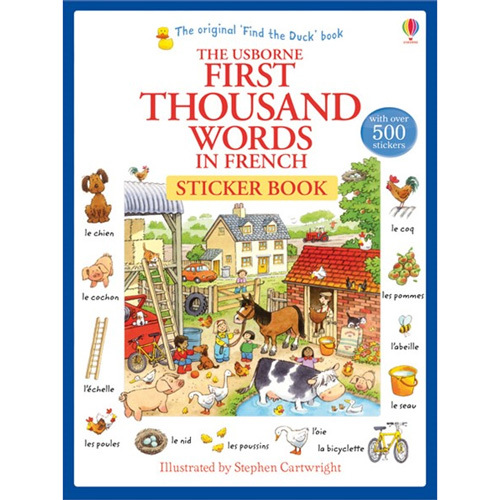 This sticker version of the very popular Usborne First Thousand Words in French is an entertaining, talk-about book for children (and adults!) who are just starting to learn French. Bright and amusing pictures illustrate a basic French vocabulary. Children can learn new vocabulary by matching stickers to the French words around the edge of each page The stickers encourage children in active learning and help association of the French word with the object to ensure effective vocabulary building. The Usborne First Thousand Words in French Sticker Book is suitable for children of all abilities, even complete beginners. At the end of the book there is an alphabetical French / English list of all the words in this book. If internet access is available, all of the words can be listened to on the Usborne Quicklinks website.